Happy Holidays! The dazzle and glamour of the season are a big part of why this time of year is such a visual delight so what better way to partake in the glitz and the glory than to pin a bit of it somewhere on your outfit? 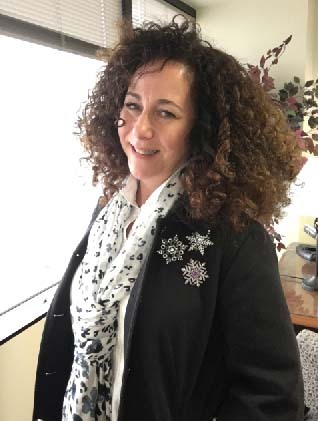 With that in mind, Adrienne of The Rich Life in Wine Country and I decided to devote December’s “How I Wear My” to that bejeweled accessory that is making a comeback in a big way—the brooch! One of my favorite hashtags to check out on Instagram is #bringbackthebrooch (I am posting on IG as @everythingjustjewelry), and after putting together this post I do believe we can safely declare that the brooch is most definitely back. 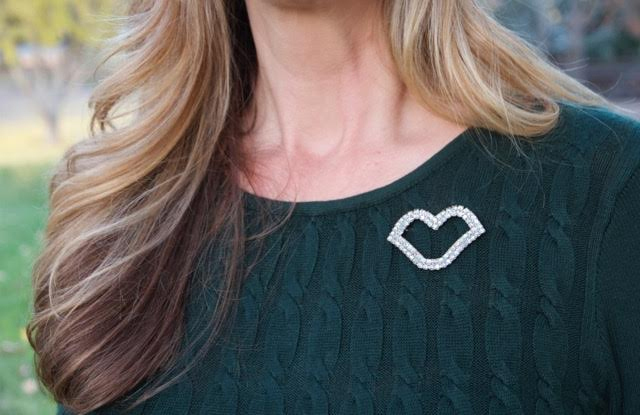 I bet you are going to want to wear a brooch every single day after seeing this post. Enjoy! This is such a great brooch on Adrienne. It reminds me of a heart from far away, but on closer look it mostly definitely resembles a pair of lips! A closer shot of the brooch. I love it! 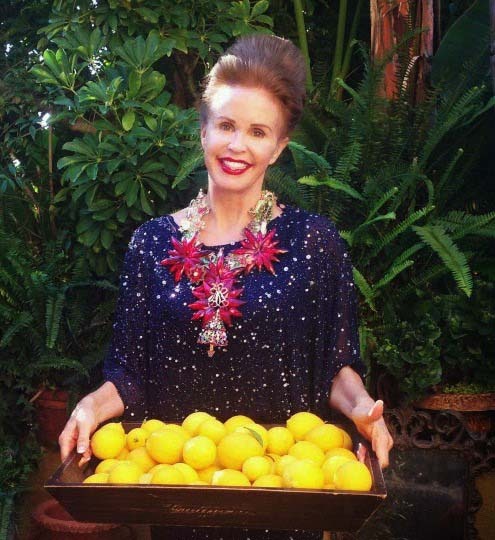 I cannot even begin to tell you how much I love this photo of Tamera—the necklace fashioned out of gigantic red poinsettia brooches, the tunic that is like a midnight sky laden with stars (and so ready for the disco too), the huge tray filled to the brim with lemons, the lush greenery behind her. This look is so California, so old Hollywood, and so very Tamera to boot. What a treat for the eyes! This is such a good color on Ana, she looks gorgeous! I am crazy for this fish brooch, both the look of it and the story behind it. 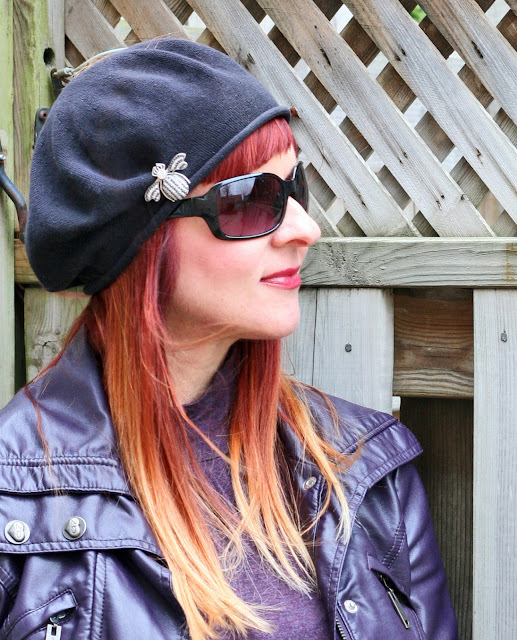 Suzanne of Suzanne Carillo has pinned this adorable vintage bee to her purple beret and I love the jaunty look of it, especially when paired with the purple biker jacket! This is such a great ensemble on Trina, I love its menswear-inspired theme and the splashy colors in the tie! I couldn’t resist magnifying the photo a bit so you can have a closer look at the brooches. A slightly closer look at the brooches. I love the dog at the top! Glenda of So What To Twenty! 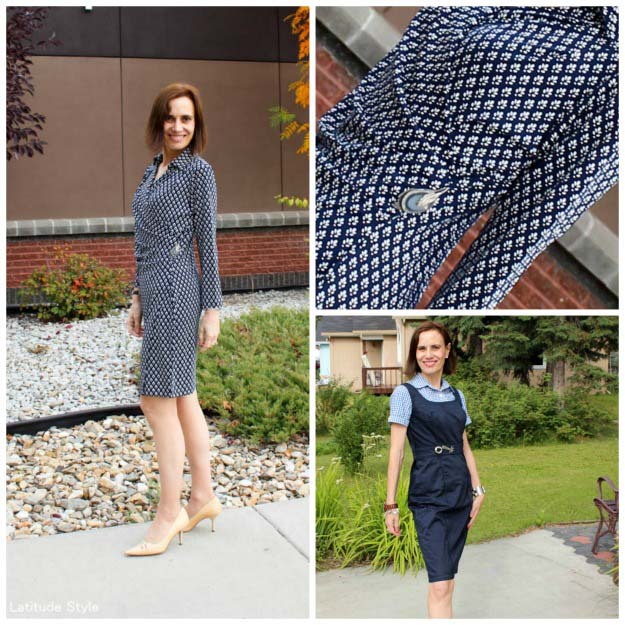 joins us wearing an Isaac Mizrahi-inspired outfit. The brooch is vintage Ann Taylor and I love that she pinned it to the waistband of her skirt. 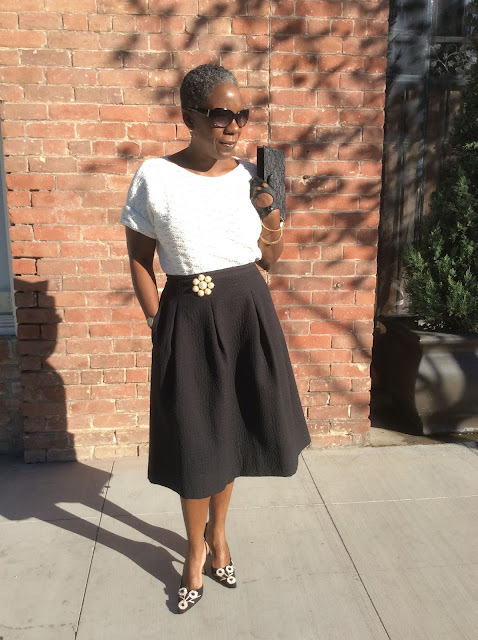 I think Glenda looks so ladylike and elegant in this ensemble. It’s my new favorite picture of her! Love this mix of textures and I am crazy about the brooch! Jane of Toronto Shopoholic wore a pretty vintage brooch pinned to her knit hat for this photo. You can see it right above her sunglasses, just look past the snowflakes! I think that is such a wonderful ensemble, from the brooch on her hat to her pink sweater and red pants! 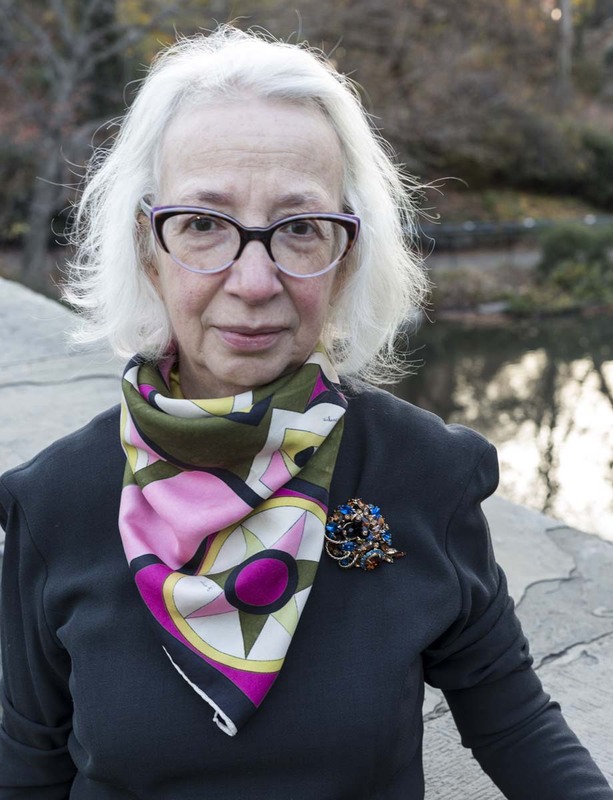 I really like this brooch on Karen—and adore that it belonged to her great Aunt Ethel!—as well as the berry colors in her outfit and the fact that she remade jewelry to suit her taste. The brooch and the earrings go so well together! What a perfectly glamorous look this is on Shelbee! 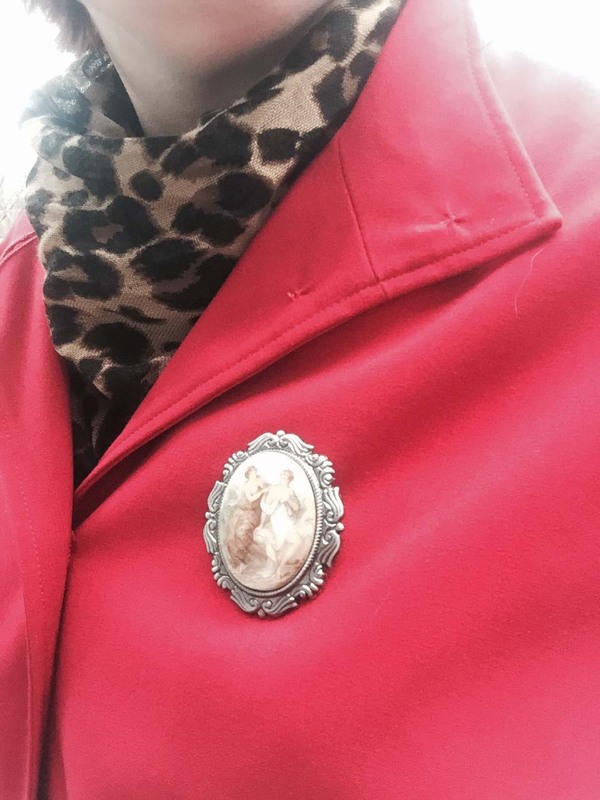 I never get tired of red and leopard and the addition of a brooch makes them all the more stylish! A detail of Shelbee’s brooch. 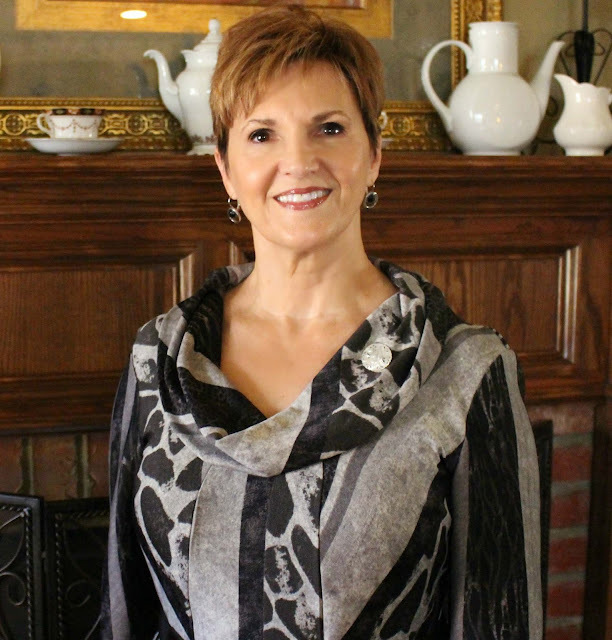 Teresa, wife of our photographer friend Denton Taylor, is wearing a gorgeous vintage Hattie Carnegie brooch along with a Pucci scarf. I love the glamour, uniqueness, and color of Hattie Carnegie designs and I am happy to report that you can find them, sometimes for a song, on eBay! I hope to add one to my collection soon but there are so many to love, it will be hard to choose. I am dying over the blue in this one and Denton was kind enough to include a detailed shot of this beauty. A stunning Hattie Carnegie brooch. I weep! Photo by Denton Taylor. 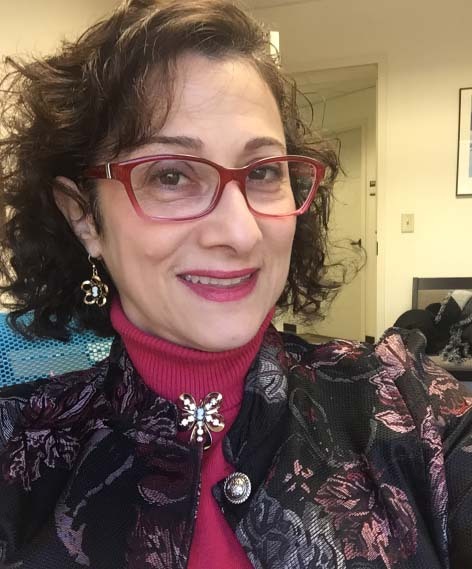 I am reminded that the great costume jewelry collector Barbara Berger once instructed all of us writers at a press preview for her own collection of jewels that the back of jewelry is almost more important than the front so you can see how it is constructed. I present Exhibit A in what Ms. Berger meant! The amazing details in the back of the Hattie Carnegie brooch. Look at the construction! Photo by Denton Taylor. 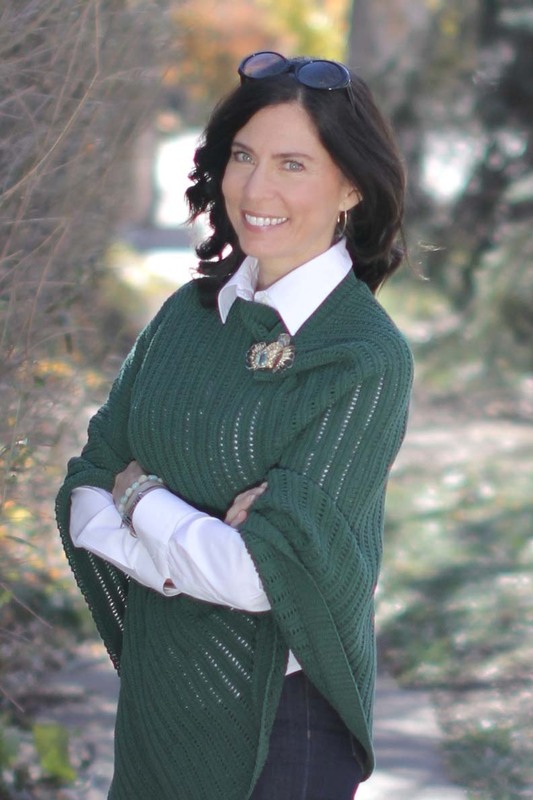 I love the way Nora has taken a vintage brooch and incorporated it with pieces from her own collection, as well as other designers, and made a very modern look with a bit of vintage flair! 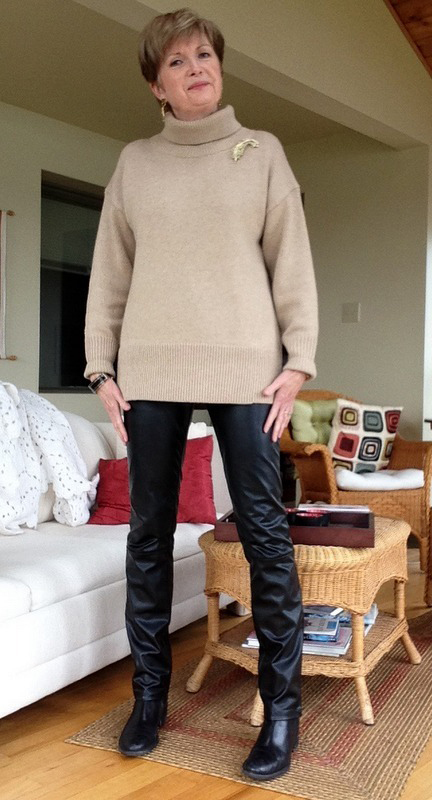 What a great December outfit on Susan—I love the edginess of her leather pants worn with the pale and chic sweater and the heirloom feather brooch adds the right amount of glamour! I love that Rena is wearing not one, not two, but THREE beautiful and sparkling snowflake brooches. What a great collection. They are so pretty! 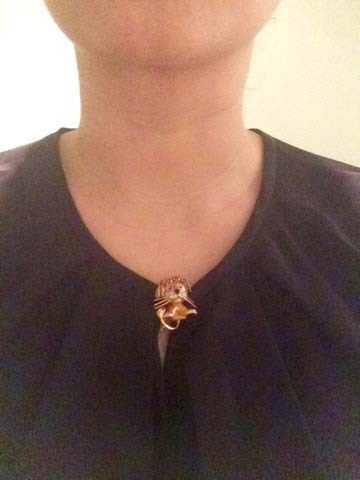 Let me know if you ever wear a group of brooches like Rena (or Trina, above) does! And Happy Hanukkah to all of those who are celebrating it this week! Elizabeth of Beauty Without Within. I love the delicacy of this brooch, the sheen of the mother-of-pearl, and how its open-work design reminds me of lace. A detailed shot of Elizabeth’s beautiful pin. I love this idea so much and wish I saw this look more every single day. I think I will give it a try myself! Naomi of Coulda Shoulda Woulda. 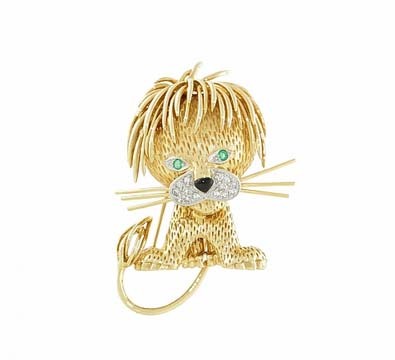 Naomi of Coulda Shoulda Woulda is the lucky owner of one of my favorite brooches of all time: A Van Cleef & Arpels Lion Ébouriffé (Tousled Lion) brooch of gold, with emerald eyes, a pavé diamond face, and the cutest black enamel nose. I weep! It is one of the charming animal brooches Van Cleef & Arpels became known for when they introduced “La Boutique” in 1954, wanting to attract a younger clientele to the house with these whimsical pins. Princess Grace of Monaco owned this brooch herself, how’s that for exclusive company? I adore how Naomi has worn it here, right in the center of her black blouse. Naomi and I have discovered that we have very similar tastes in jewelry so make sure to swing by her blog, because she has fabulous taste, if I do say so myself! She’s my eyes for jewelry and fashion exhibits in London! The same brooch Naomi wears is currently available over at Beladora! My mother on her birthday! My mother sent a photo of herself as she celebrated her birthday last month wearing the Buckley London Poppy Brooch I gave her as a present. I first learned of the brooch on the blog Duchess Kate, which showed Kate wearing this pin on a black lace Dolce & Gabbana dress. I loved how sparkly it looked, especially against black lace! The poppy is in honor of Remembrance Sunday, to commemorate British and Commonwealth soldiers who died during the world wars and other conflicts. Since I come from a military family, I really love that Buckley London donates all profits from the sales of their Poppy Collection to the Royal British Legion and Poppyscotland. 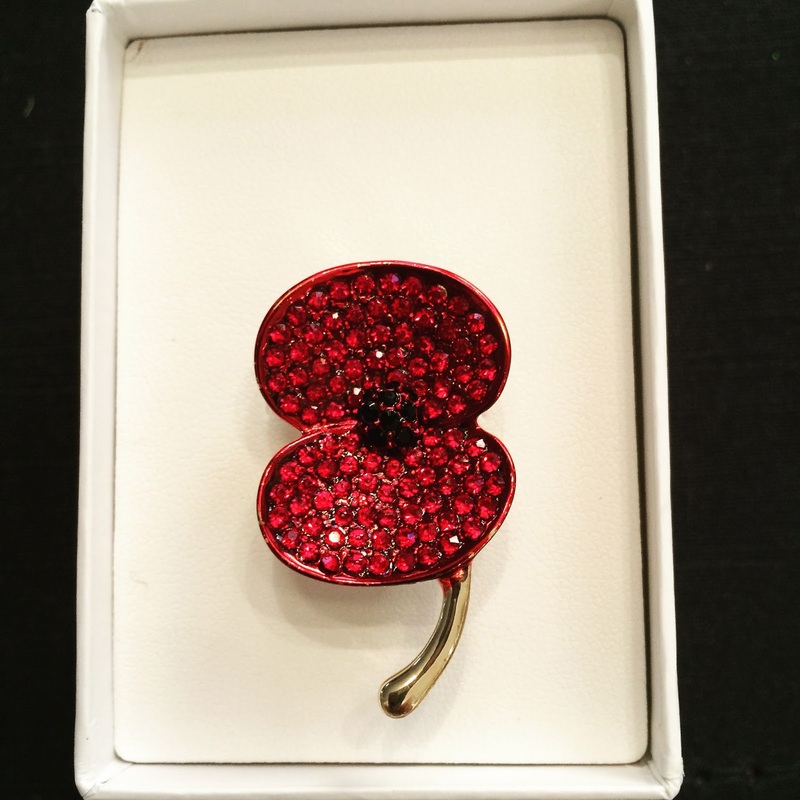 Not only is this brooch so red and glittering and gorgeous, it’s a brooch in honor of fallen British soldiers and a brooch for a good cause! A Buckley London Poppy Brooch (the small size). The Duchess of Cambridge has this too! Wearing one of my favorite brooches! Here is the brooch in sunlight. Such a great shade of iridescent blue! I have several brooches that I really love but I couldn’t resist sharing this one, from the late 1950s or early 60s by 11 W. 30th Street that I picked up last year at a thrift shop close to where I live. I paid just $14 for it (and Ana of Mrs. American Made will be pleased to know it was made in America)! Because it’s a fairly large brooch and is so wonderfully blue, I wanted to keep everything else low-key so I paired it with my J. 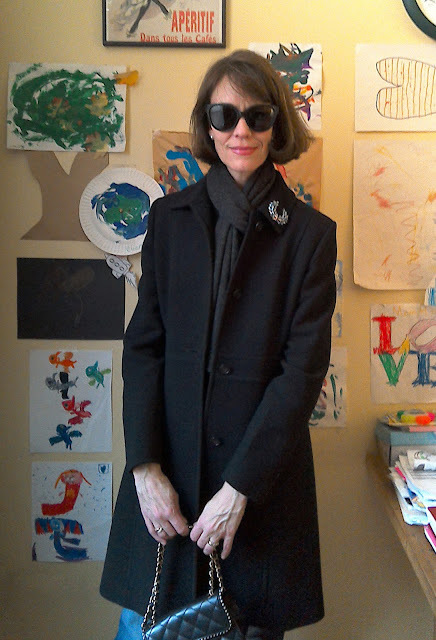 Crew Lady Day coat, a gray scarf, denim, Mikimoto pearl studs, and my beloved mini Chanel bag. When the picture was being taken Tippi peeked through the blinds to see what was going on. I tried to lure her closer with my bag but you will be happy to know she cares nothing for Chanel and only for the potential cat treat I might have in my hand. 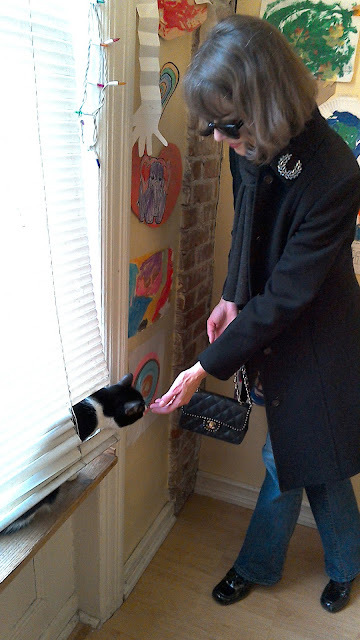 Tippi thought I might have a treat for her. 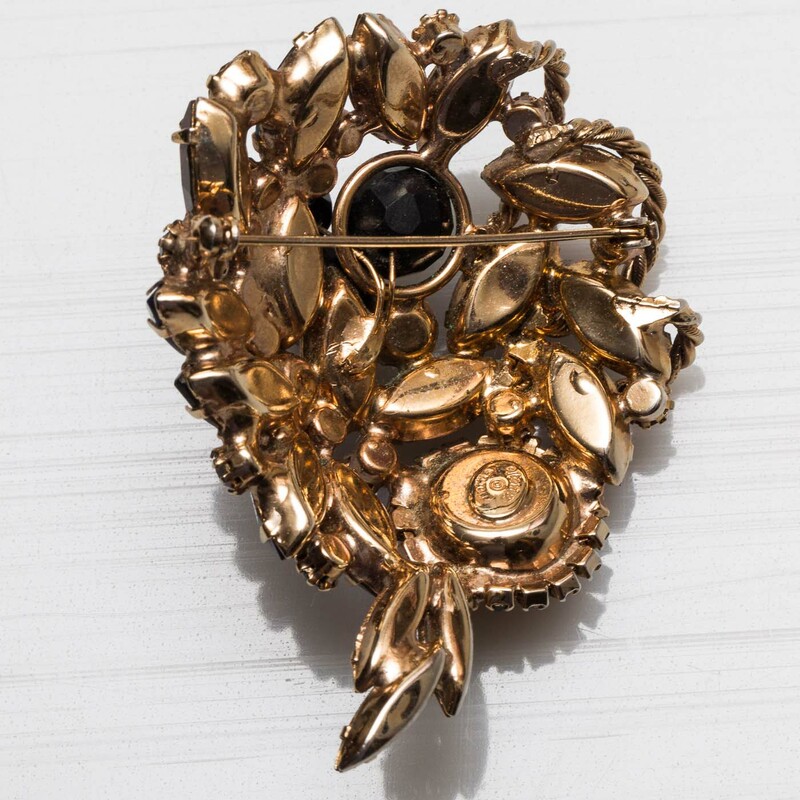 I hope you are wearing all of your brooches this holiday season. I am going to try to wear one daily throughout December! For January we are going to focus on another accessory that is an easy way to add a bit of style to an outfit—gloves! Whether they are made of fur-trimmed leather or fashioned from smooth silk, whether you wear opera-length stunners for a night on the town or a smaller pair trimmed with bows to brighten your day, join us for “How I Wear My: Gloves.” Send photos to howiwearmy@yahoo.com by January 5, 2016 and be sure to tell us a little bit about your gloves and outfit! 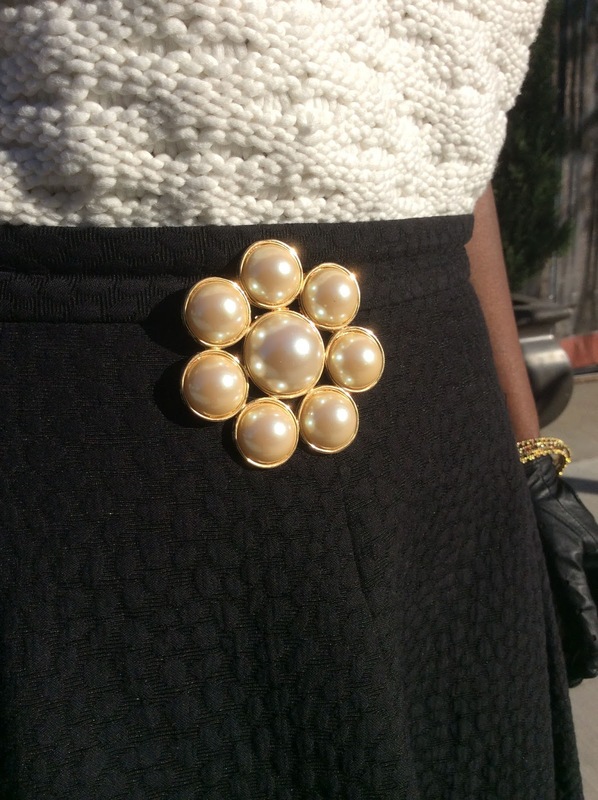 Do swing by Adrienne’s to see even more stylish looks featuring brooches. And THANK YOU to all the fine foxes who participated this month and all year long! 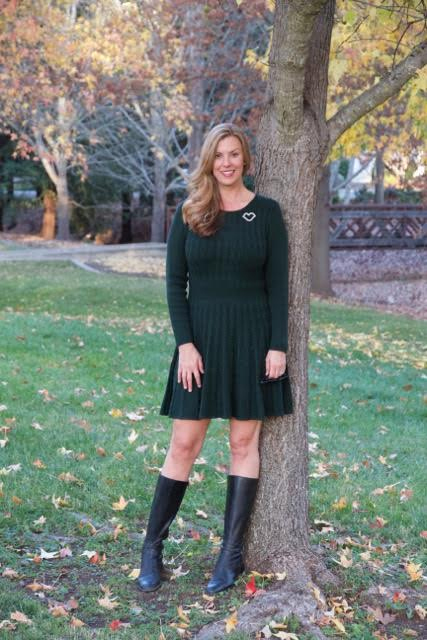 Be sure to come back on December 23 to see our “Best of How I Wear My: 2015.” It is going to be one stylish end-of-the-year roundup! What lovely brooch looks! I love your mom's photo - she looks so happy. And that poppy brooch is stunning! Your brooch is also gorgeous. I love its opalescent glow - and the way you pinned it. I'll have to try mine like that. Another great HIWM year comes to an end. Can you believe it? I am looking forward to our Best Of post in a couple of weeks. Jill thank you ever so much for your sweet and poetic words describing my photograph! Truly appreciated my dear! Another fabulous round up to be sure! And may I say you are looking perfectly New York City chic in your ensemble! I always leave visiting your blog … with a huge yearning to revisit your stylish city! Sending big Holiday wishes to you and yours! Just popped over from Adrienne's post. So lovely having a double helping of gorgeous and diverse brooches to enjoy and a bumper crop here too. Thank you Jill and Adrienne and looking forward to gloves next month and the yearly wrap at the end of this month! :-) Thank you and Adrienne very much for setting this HIWM challenge up! I think it's one of the best ones to date. It's so interesting to see how and where all the lovely ladies wear their brooches. Great inspirations all around. 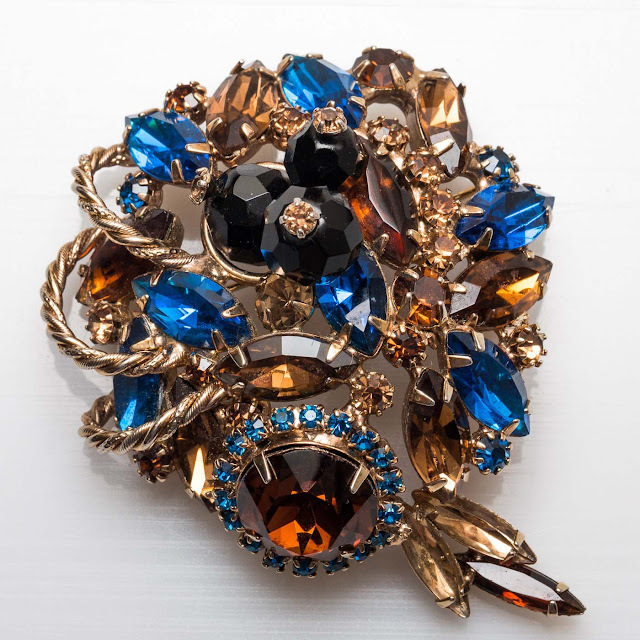 Your vintage blue brooch is a real beauty and matches your eyes. Congratulations on your great find. Have a wonderful and very HAPPY week! I found your HIWM challenge just last month and it's been fun looking through all of the past editions. Thank you for including my brooches in this month's publication and I got some great new ideas for how I might wear my other brooches. I'm looking for the 2016 HIWM challenges. This was a really fun link up. Goes to show there are so many ways to wear a brooch. I laughed when I saw Tippi sticking her head through the blinds. I adore that poppy brooch, the lion and especially Teresa's Hattie Carnegie brooch. Just stunning! A ground group of ladies styling so many pretty brooches. I think I need to add at least one or two in my closet. Love that you're bringing the brooch back, Jill and Adrienne! Jill, your mom's poppy brooch is gorgeous, simple and stunning. 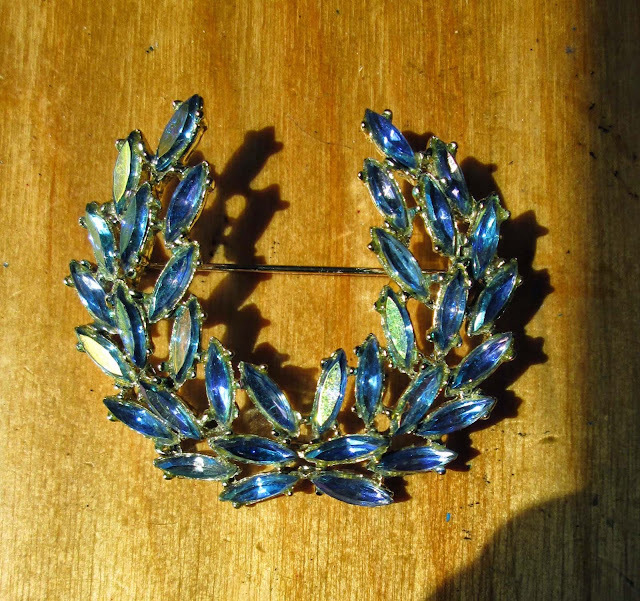 And, I love the blue colors of your classic brooch. 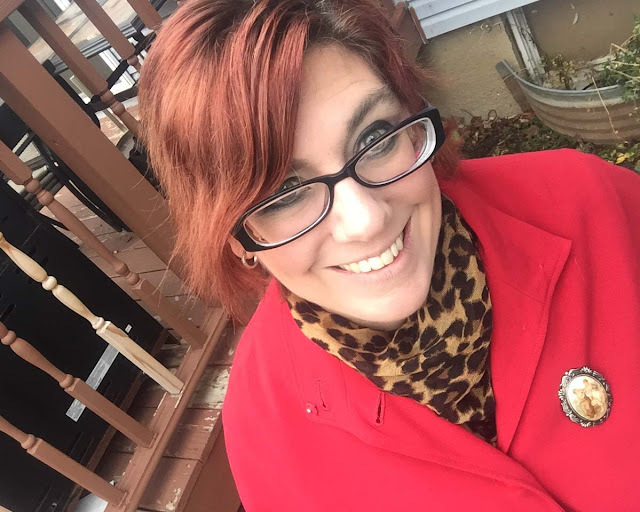 This post has inspired me to add a brooch to my jewelry collection! The brooches are beautiful. Everyone's. I especially like the poppey brooch of your mom. I forgot that I can send in two entries. Oh well, at least I participated again for a change. Forgot to say that although I love all the brooches I love the way Nicole has used them. I do that often too. Put them in a place where people don't expect them right away. Everyone looks lovely! Thanks for another fun style challenge! 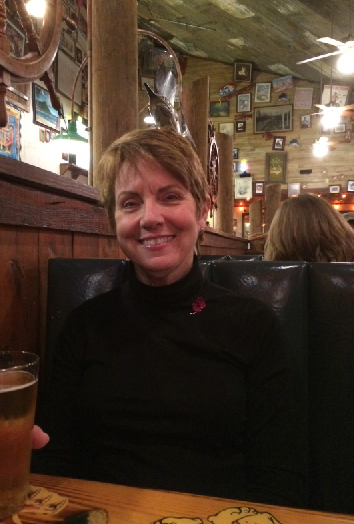 Hi Rena, I am so glad you found us and even happier that you joined us! 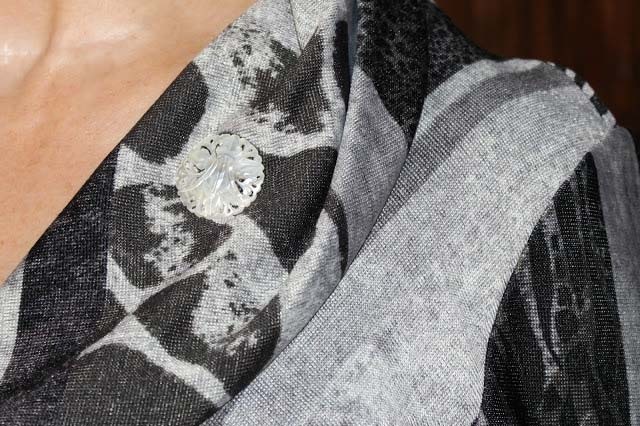 I have never seen anyone wear snowflake brooches the way you do and I just love that look. They must be so sparkling in person! It is nice to meet you and I hope you join us again next month!